Welcome to our gallery featuring the best gravel patio ideas. 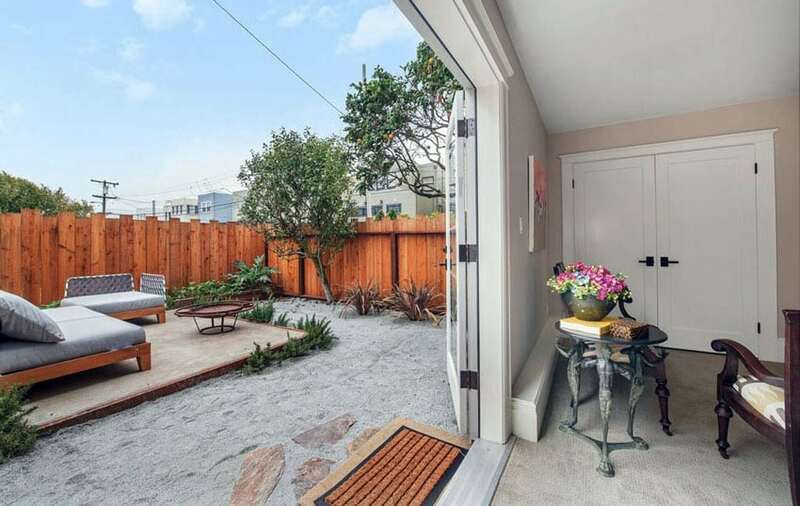 A gravel patio is an excellent addition to any home not only because of the added beauty it gives, but also because of the multiple purposes it can offer. It can easily transform your backyard into an extension of your living room space, a place to dine and bond with the family, to enjoy a grill out with friends, or a personal sanctuary to enjoy a book or relax after a long tiring day. Among the available materials in the market, gravel is one of the most desired ground cover for patios. It is well loved because of the numerous advantages it gives. If looking for a more practical solution and alternative to an expensive stone patio, wooden deck or interlocking bricks pavement, pea gravel is your best option. Design it however you want, either alone or mixed with other types of stone aggregates or incorporated in your landscape setting. Since it also offers ease in installation, making your own gravel patio can be one of your next “DIY” projects. Requires little maintenance. Gravel patios do not become muddy during rain. Cost effective. Gravel is cheaper than other filling materials available in the market. Compared to concrete and large stones, gravel usually costs around $35 to $55 per cubic yard. Improves drainage. Gravel drains quickly. When rainwater runs over a gravel patio, it just soaks into it rather than accumulating. Unlike other filling materials that have to be placed in a slight incline so that rainwater does not run off, gravel may be placed as is in a patio. Controls erosion. Gravel and stones prevent soil from eroding by holding it in place. Easier to compact than other fillers. Prevents weed growth. Unwanted weeds are not able to grow out of gravel. Ideally, gravel must be laid at least 4 inches thick from the ground to prevent weeds from growing into your patio. Keeps rodents away from your garden. Rodents are not able to dig through a bed gravel unlike soil. Easy to walk on. Pea gravel particularly has smooth rounded edges compared to larger stones which sometimes have jagged edges. It does not cause discomfort even when walked on barefoot. Since it is a softer surface to walk on, it is more bearable rather than walking on coarse large rocks. Easy to install. Gravel patios require little effort and skills to install. Even if you do not have any previous experience for such, gravel can be laid out without any trouble. Aesthetically pleasing. Gravel allows for more creativity in terms of design. It can be easily mixed with other stones or landscaping materials to add beauty to a landscape, garden or patio. Beneficial to plants. When gravel is used with plants or in a garden bed along your patio, gravel traps moisture thus reflecting heat better. It is a great alternative to wood mulch as soil covering. Improves the value of your home. A gravel patio is a stunning addition to any garden which improves the value of your home at a low cost. It is a wise practical investment which can give a lot of benefits in the long run compared to other filling materials. Lasts multiple seasons. 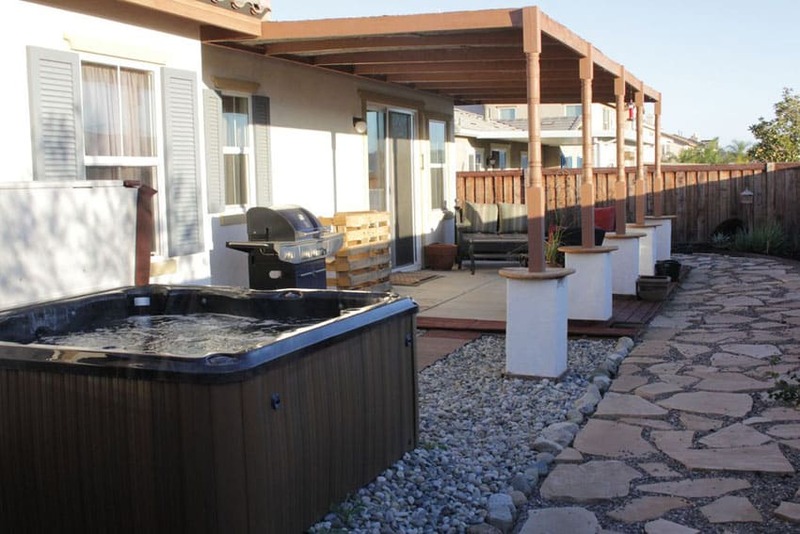 Gravel patios can withstand any climate or weather including storms or snow. A layer of snow in a gravel patio may be easily removed with the use of a snow blower, a shovel or salt. It also works well for warm climates as it does not require watering. Gravel patios last a long time. Gravel does not decompose and will last years. Loose gravel surrounds this paving stone sitting area with a portable fire pit, creating an excellent spot for relaxation and socializing. Relocating. If you plan on changing the location of your gravel patio, it is a task which is hard to manage. Since it is made up of loose stones, everything needs to be collected and transported carefully from one place to another. Hazard to children or pets. Small pieces of stones in a gravel patio may be a potential choking hazard for pets or toddlers. Be extra careful if you have young kids or pets at home. Cannot be used for high traffic areas. Loose stones in a gravel patio can become easily lodge into shoe soles. Small stones such as pea gravel is not advisable to be used in walkways. Gravel can be easily transferred or scattered to other areas of the yard or home. Be sure to use an edging or border for your patio to prevent it from spreading. Requires repeated raking to smoothen the path. Heavy footmarks causes dips in the gravel and can sometimes shift the small stones form its intended place. Prevent this by putting a base layer of rocks in your patio before laying out gravel. If putting furniture in your gravel patio, it requires an added base. In some cases, gravel need to be replenished in 3 to 4 years as it starts to soak into the soil. 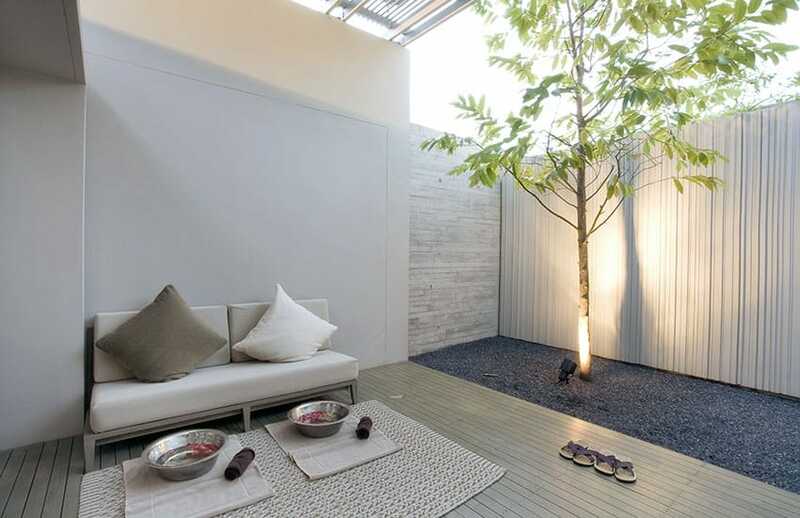 This Asian style backyard deck has a harmonious ambiance with its black pea gravel and minimalist furniture and decor. Pea gravel are small stones found near bodies of water and is characterized by their smooth texture. Its name was derived from its size which resembles a green pea, usually ⅛ inch to ⅜ inches in diameter. Its colors are usually white, beige, shades of gray, rust, brown, red, blue or translucent. It is usually used for landscaping or gardening and its common applications are patios, pathways, driveways, playgrounds, paver fillers or as mulch material around plant containers. A pea gravel patio is a treatment for an outdoor space or paved area adjoined to a house wherein it is mainly covered with pea gravel. There are different ways to create a pea gravel patio. Sometimes it is mixed with other materials such as pavers, bricks, slate or flagstone to add an visual appeal. Other landscaping elements such as plants, a garden bed, water feature or even a fire pit may also be added to a gravel patio. Pea gravel patios are perfect for European homes or Mediterranean inspired landscapes. White pea gravel works well for Classic patios offering a timeless feel. It is appropriate for any landscape style because of its colors. 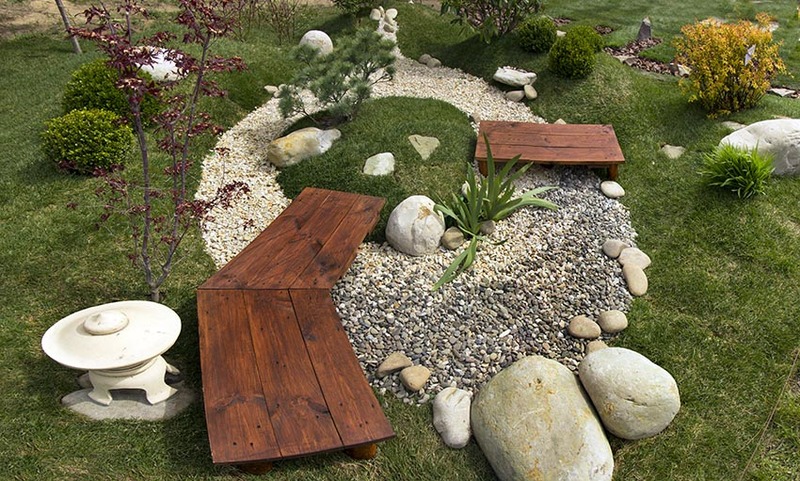 Two types of gravel pebbles make up this beautiful Japanese rock garden complete with wood walkways leading to a grass island. 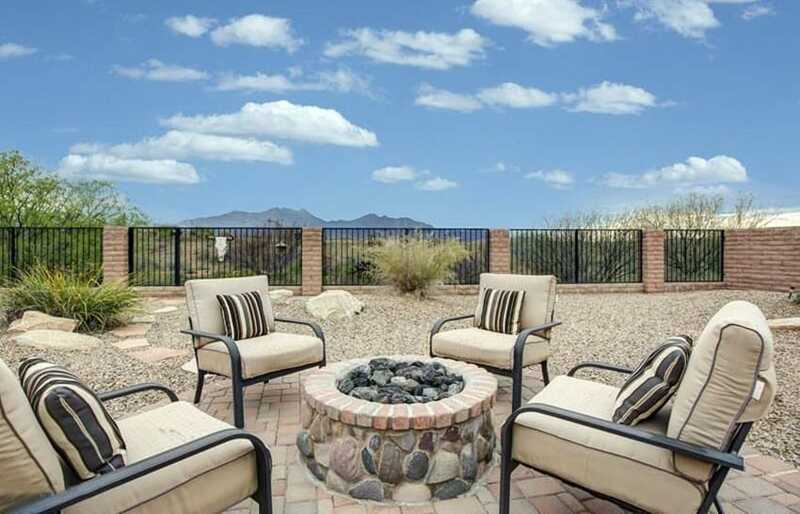 A gravel patio fire pit may be built adjacent to your home as a place to entertain guests and to gather family members. This casual rustic design made use of interlocking layers of bricks from the fire pit walls and large coarse rocks as filling material for the surrounding space. The same flooring material also flows continuously to the pathway giving the space a more uniformed look. A pea gravel border is an edging material placed around the perimeter of the gravel patio. Its main purpose it to contain the stones in one place. Aside from the function it offers, a gravel patio border also adds elegance and aesthetic appeal to your patio by defining it. Some of the edging materials which can be used as a gravel patio order are bricks, stones, cobblestones, flagstones, metal, galvanized steel, plastic, bender board, cedar or pressure treated wood. These items can be sourced from local home improvement stores. In choosing a material for your pea gravel patio border, remember to choose something which has a good quality. Do not skimp on the edging material as it will last longer. Regarding the size of the pea gravel patio border, its height must exceed the depth of your patio excavation. It is typically ½ inch higher than your dug out area but this dimension is adjustable according to your preference. 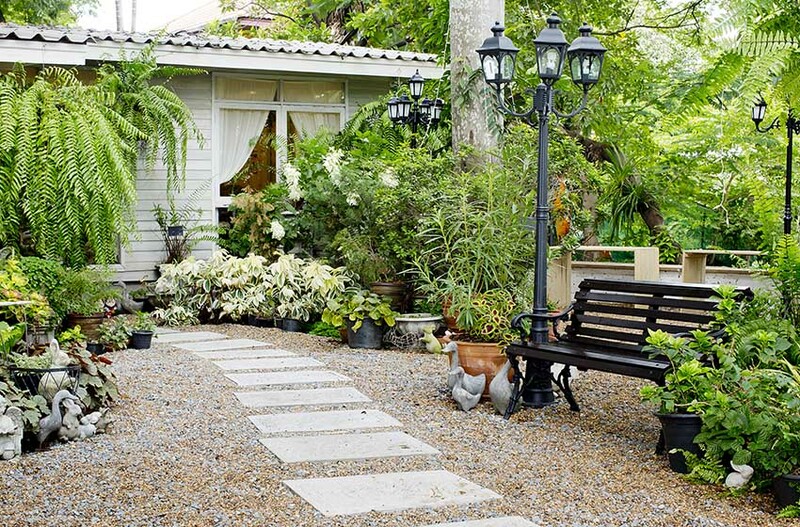 Gravel may be used to cover large areas of backyard spaces to give them a more natural feel. Limestone pavers are used as a walkway and as flooring material for the outdoor living space. The Rustic theme of this paver and pea gravel patio is complemented by the warm earthy color of the stones used. The material cost of pea gravel usually varies depending on the size of the project. For small projects, pea gravel usually costs around $300 to $400 for a 200 square foot coverage. Since small projects have small material requirements, pea gravel can be sourced from local home improvement stores. Purchase gravel in bags of 0.5 cubic feet at approximately $4 to $6 per bag for the plain stones and $8 for the colored variant. However, this cost still varies depending on the location. For larger projects, pea gravel must be purchased from a landscaper or a gravel and stone supplier at tons or cubic yards. Plain pea gravel costs around $30 to $35 per cubic yard or $40 to $45 per ton. If you prefer the colored variety, consider an additional amount of $20 to $50 to your cost. Buying in bulk can save you more because the price can go as low as $15 to $20 per ton for a minimum quantity of 10 tons. You can avail of the wholesale from gravel distributors if you have this amount of material requirement. In terms of installation , a pea gravel patio can cost around $5 per square foot, including the base rock. The bigger the project is, the more expenses you would incur. Style or type of stone – The least expensive kind of pea gravel are those with solid colors. As mentioned earlier, choosing a colored type of stone would cost more. Rounded and more polished stones are also more expensive. Depth of the pea gravel patio – The depth of the pea gravel patio naturally affects the amount of stone you will be needing to cover it. The deeper, the higher the cost. For patios which will only be used as walkways, a 1 inch of pea gravel is enough. A depth of 2 inches to 4 inches is required for gardens with plants while 6 inches is needed for patios with furniture. Border or edging material – Edging around a gravel patio is necessary to keep it in place. Wood edging material usually costs $5 per linear meter and metal edging material usually costs $6 per linear meter. Labor – Installing a pea gravel patio by yourself can save you a reasonable amount of money, however if your choose to hire a professional landscaper to do the work, consider an additional amount of $13 to $65 per hour in labor costs. Laying down gravel usually takes 2 hours to complete or more. Delivery charges – Some suppliers offer a free delivery for bulk orders of 10 to 20 tons. Delivery charges depend on the distance, ask your supplier so you can allot a specific budget for this. There are different ways to create a pea gravel patio. Because of the versatility of pea gravel, it can be mixed with any other stones or landscaping material to produce a patio design which suits your taste. Majority of these gravel patio variations require a level foundation and uses the “dry laying” method. 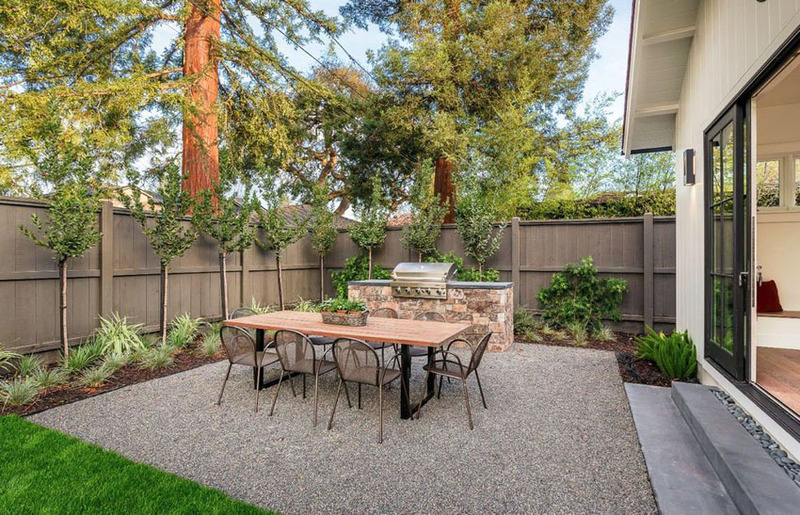 An excellent spot to enjoy outdoor barbecues and parties, this pea gravel epoxy patio has a grilling station and dining table. The contrast between the pea gravel and the rough sandstone cooking station works perfectly for this contemporary themed space. Pea gravel epoxy patio, as the name suggests, is composed of 2 materials : pea gravel and epoxy. Epoxy acts a binding agent to keep the stones smooth and leveled for the patio. When these two materials are mixed, it creates a durable flooring material which can cater to high traffic areas. This type of patio is also quick and easy to do. Installing a pea gravel epoxy patio is basically just mixing gravel with epoxy and spreading it. Set up as a fancy outdoor living room, this pea grave patio evokes a rustic yet old world feel. The area rug adds flair to the whole look of the space. 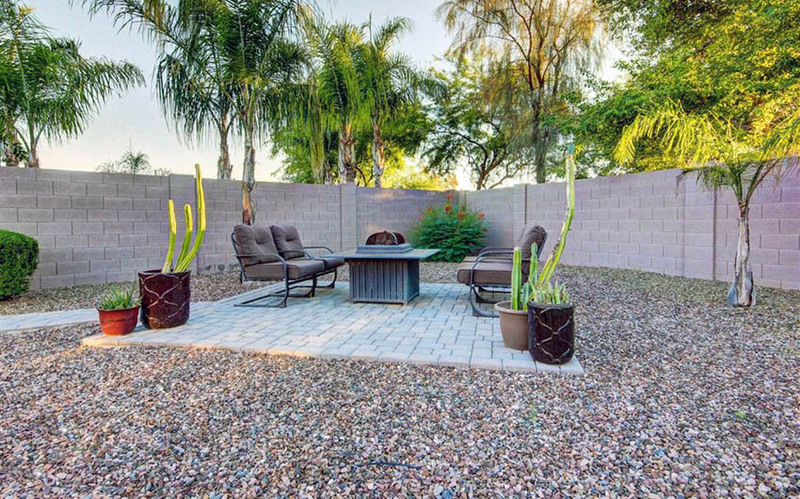 This is an example of a minimalist backyard design with a crushed gravel patio with a fire pit. The plain concrete finish of the raised planter box and natural wood for the fence provides a unique beauty in the unfinished overall look of this patio. Crushed gravel patio is composed of crushed stones or a type of construction aggregate which is usually 1 ½ inches to 2 ½ inches in diameter. Crushed stones are produced by breaking down a specific rock such as granite, limestone, marble or trap rock into a desired size. Crushed rocks such as white marble chips are perfect for Classic inspired gardens. 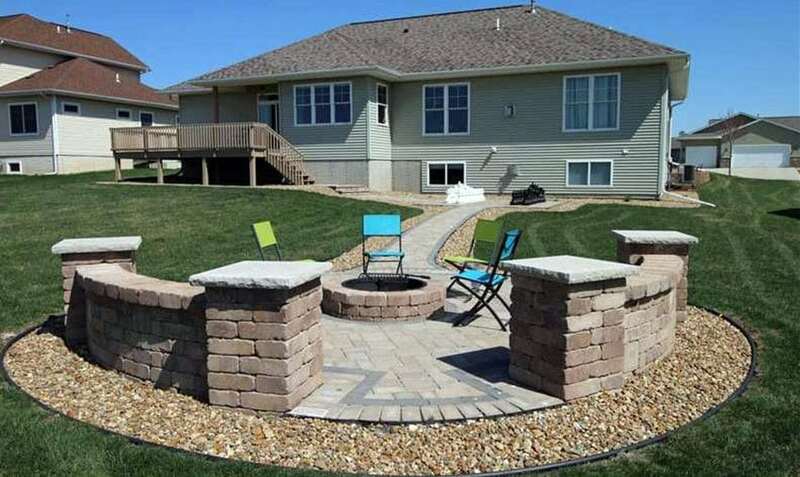 Crushed gravel is usually used as a reliable foundation rock base because it can be compacted and can support the weight of outdoor furniture. Aside from this, it also works as a perfect ground cover for patios because of the natural and organic look it gives to a space. It is also affordable and easy to maintain. Just like pea gravel patios, crushed gravel patios are easy to install by just spreading the stones across the surface. 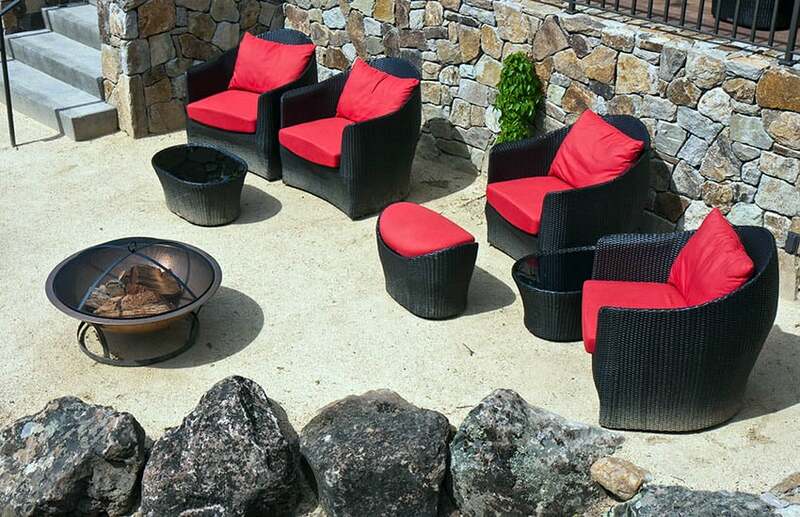 Crushed gravel patio sitting area with metal outdoor chairs surrounding a large bowl fire pit. 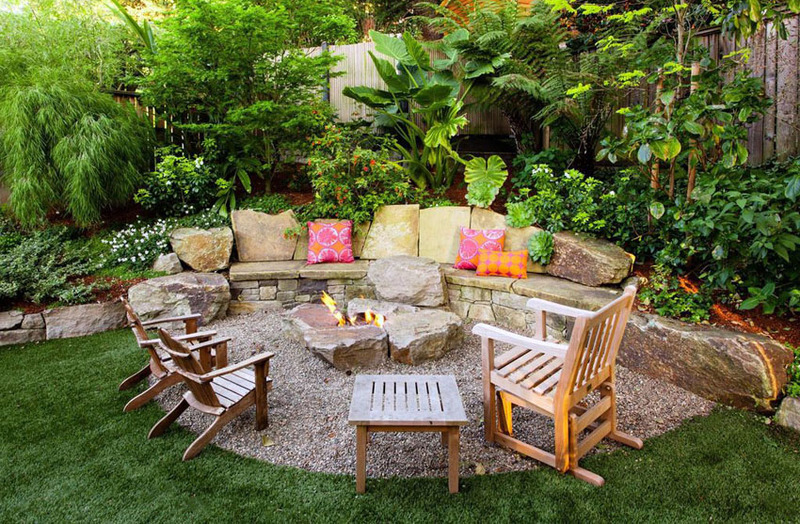 An gravel patio fire pit serves as an attractive addition to any backyard. Whether it may be for a grown up chitchat or bonding with kids over roasting marshmallows, it becomes a favorite place for the family. In this design, the different sizes and colors of stones used all throughout the space gives it depth and dimension. 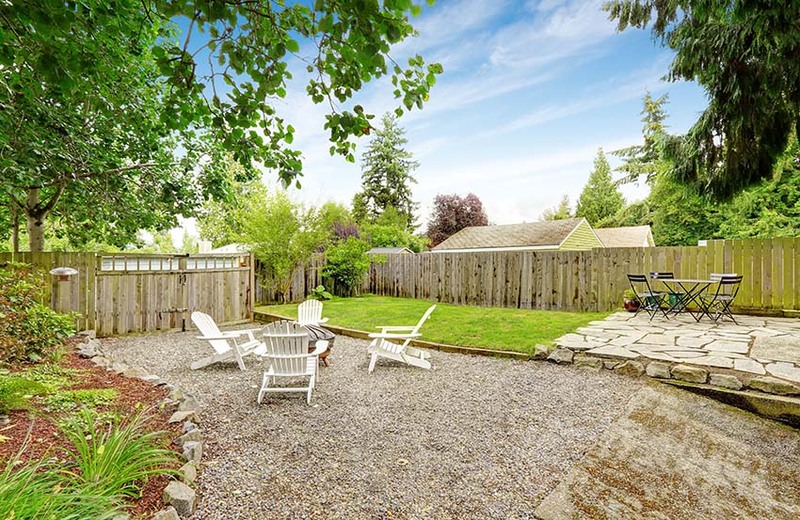 This small circular crushed gravel patio is situated in the far corner of the backyard and is bordered by paving stones and equipped with a wood table set and umbrella. Concrete paving step-stones lead through this gravel backyard landscape to a park bench for a pleasant spot for taking in the serenity of the garden. This crushed gravel pathway leads to the large wooden structure with vaulted ceiling, fireplace and outdoor living area. 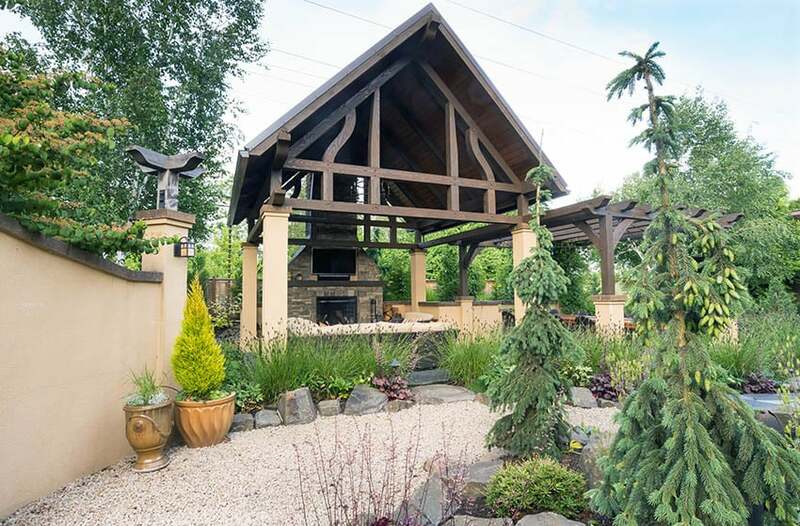 A wooden pergola provides an extra place for entertaining and socializing. This simple DIY backyard features a loose gravel area with Adirondack chairs and a border of large irregular cut rocks. There is a second sitting area made with concrete blocks with an outdoor dining set. Pavers are cut flagstones in irregular or square units. Paver and gravel patios are a combination of stone pavers arranged in a specific pattern and small pebbles which are used to fill in the gaps between – think of pea gravel acting as a grout for the pavers. Paver and gravel are a durable and affordable treatment for patios. Also, the combination of the two materials give endless design possibilities because of the diverse size, color and shape pavers have. 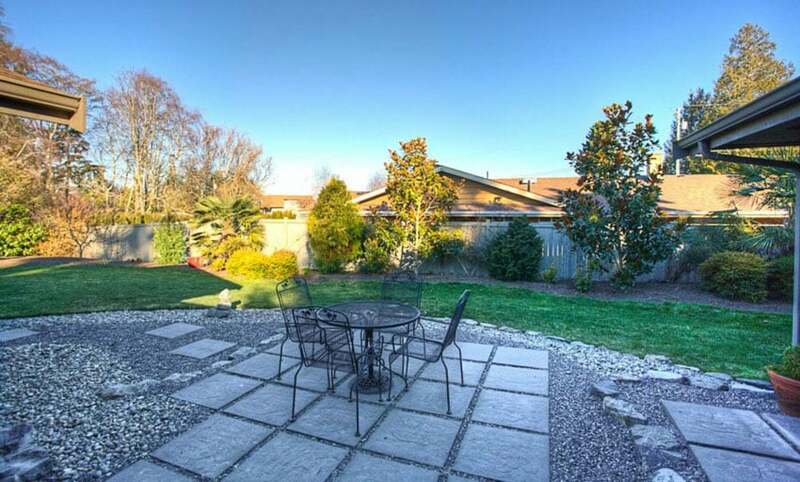 Installing a paver and gravel patio makes use of the dry set method wherein the pavers are dry set with sand on a rock and sand base and pea gravel is spread all throughout to fill the spaces between. Highly textured, this traditional flagstone and gravel patio made use of a combination of coarse gravel, large smooth stones and limestone. Variations in stone color, sizes and shape create depth and character for the patio design. A flagstone is a flat stone slab of slate, sandstone or limestone which is rectangular or square shaped used for paving. It is a preferred material for patios because of its narrow packed joints. Flagstones come in a variety of colors such as gray, brown, reddish or blue. It usually costs around $15 to $30 per square foot. Flagstone and pea gravel patios are constructed by dry laid method wherein the large stones are set in a bed of sand or pea gravel. The recommended depth for this is 3 inches. The excavated area for the patio is filled with coarse sand and gravel then flagstones are placed in a specific pattern. The joints are filled with the specific gravel of choice or sometimes, mortared or planted with grass. Flagstone and gravel patios have a natural and organic look and works for both informal and formal design styles. 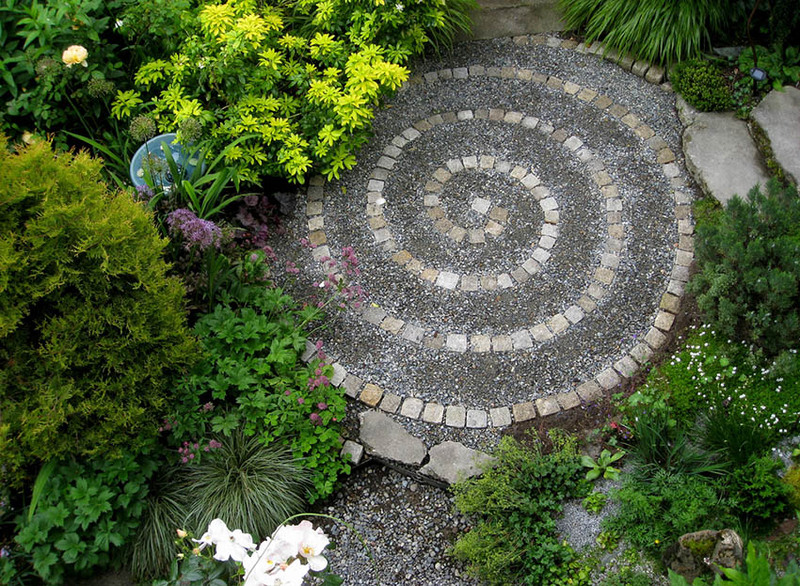 If you are aiming for a casual patio setting, use irregularly shaped flagstones and arrange them in a random pattern. While if leaning towards a more formal vibe for your patio, lay rectangular flagstones in a uniform pattern. 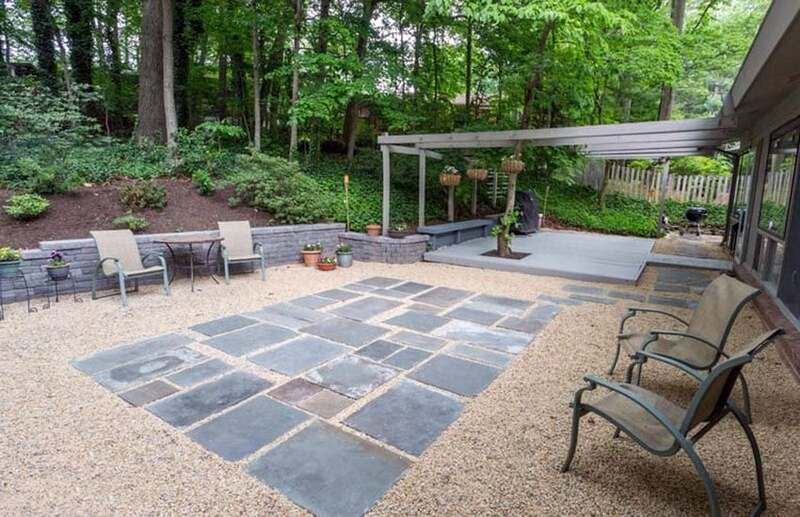 Rectangular gray slate laid out in a mosaic like pattern give this slate and gravel patio an interesting focal point. Slate is a fine grained greenish, blue, gray rock. It is usually sold for $18 to $30 per square foot. Though it costs up to three times more than other paving materials, slate still remains to be well loved by landscapers and homeowners because it is natural looking, durable and resilient. 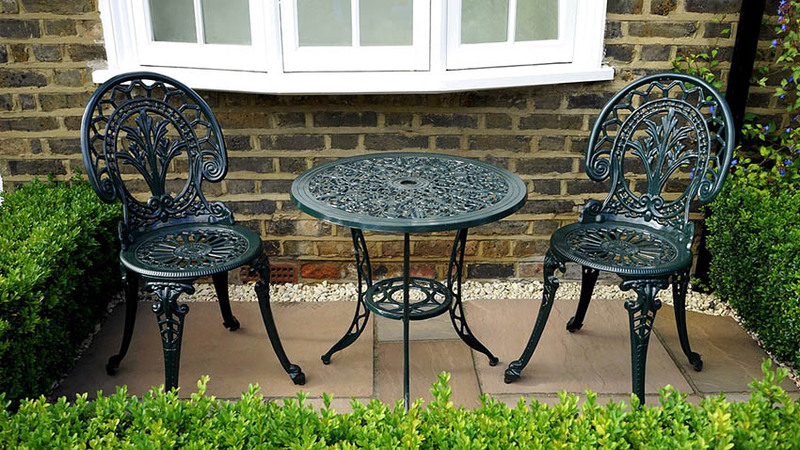 Irregularly shaped slate gives patios and garden an interesting and eclectic touch. The combination of slate and gravel works perfectly for Mediterranean inspired homes and gardens by giving them a rustic flair. Just like majority of gravel patio types, slate and gravel patios use the same dry laying method wherein the slate pieces are arranged in a particular pattern and filled with pea sized gravel in between the joints. During installation, it is ideal to start at a corner while keeping the gaps at a minimum. When the slate is completely set in a foundation base material, tamp each piece with a mallet and pour sand to fill the gaps then add grave as topper. 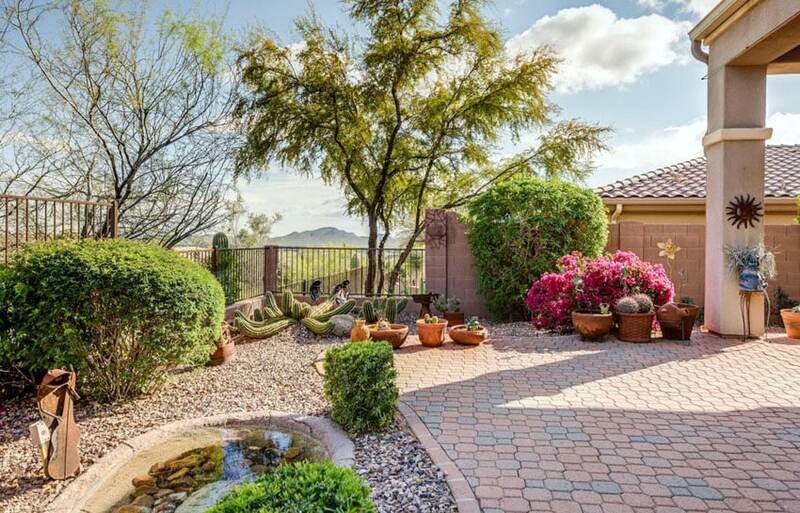 Two colors of gravel are used to create variation and contrast in this patio design. Bricks function as edging material and border to define space. This brick and gravel patio perfectly blends to the surrounding Mediterranean inspired landscape. Bricks are typically small sun dried rectangular blocks which are made up of clay. It is commonly used as building material for walls and walkways. Brick can be laid close together while pavers on the other hand interlock together and are available in a variety of shapes and sizes. The brick and gravel patio is an casual and informal treatment for backyards and outdoor living spaces. It does not follow precise cutting and has a free form approach to design. When it comes to installation, this type of patio follows the same steps as the “paver and gravel patio”, “slate and gravel patio” and the “flagstone and gravel patio”. It uses the dry laying method wherein the bricks are set into a bed of compact sand and the cracks are filled with pea gravel. Brick and gravel patios are perfect for adding warmth to a space because of its reddish color and texture. If you want to utilize your backyard for a grill-out or to catch warmth during cold seasons then you may add a fire pit to your gravel patio. 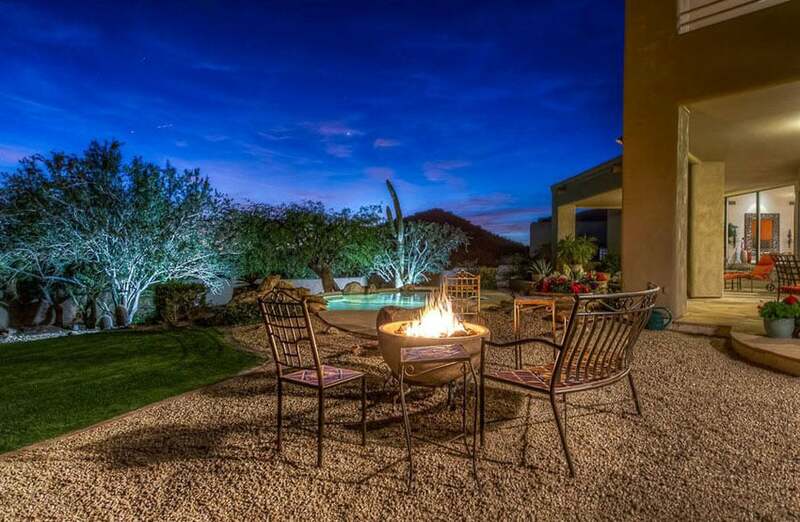 Usually circular in shape and made up of stones, the fire pit acts as the central feature of the patio. A fire pit is actually pretty easy to install. It is made by interlocking pieces of stones together to form a round shape. An adequate height is usually 3 to 4 levels or full courses of stones joined by an adhesive or mortar. Then pea gravel is added as topper for the whole ground area surrounding the fire pit. In this Mediterranean inspired raised gravel patio design, the fire pit is not built-in and is completely movable. The brown pea sized gravel covering the patio floor creates a great contrast against the surrounding grass and the swimming pool. A raised gravel patio is an outdoor space that is raised from the surrounding ground or built at a higher level than the existing ground. Installation wise, it follows the same steps for building a pea gravel patio but with an additional step of building a retaining wall. The retaining wall is built along the perimeter of the patio and serves as the border for the gravel. It may be a bricks, wood or any material as long as it can act as a platform for the patio and a barrier for the small pieces of stones filling the base of the patio flooring. This type of patio requires more filling materials and is usually 4 to 9 inches in height. It can be used if you want your patio floor to be the same level as your house’s floor or if you simply want to add dimension and elevation to your outdoor space. 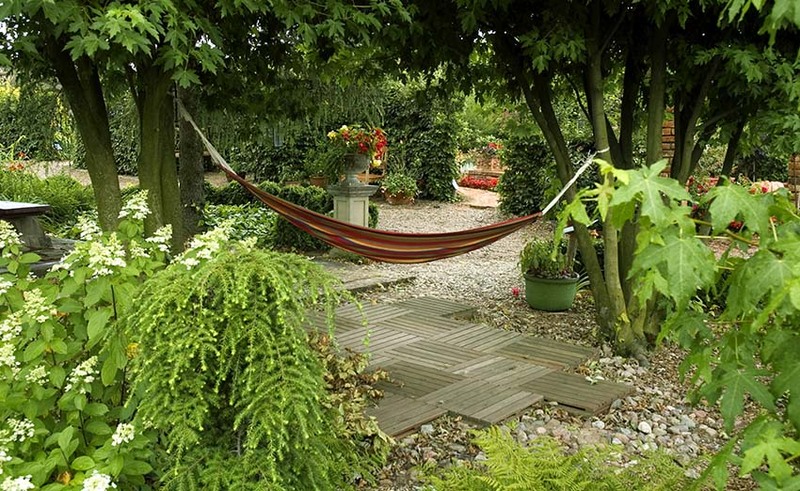 This garden backyard offers a private sanctuary for relaxing in the hammock over a bed of gravel with a small wood platform. Compared to stones, interlocking bricks or a wooden deck, a gravel patio requires less effort when it comes to installation. It can be an easy “Do It Yourself” project since it does not require special skills or any technical knowledge. A bright and inviting place for relaxation, this pea gravel patio offers a full view of the surrounding garden. The colorful printed pattern of the furniture and the accents pillows instantly brightens the space. Plan out the size and shape of your patio. When it comes to the design and shape, you can choose anything which fits your sense of style. This phase offers freedom to exercise your creativity and gives you flexibility in forming the perfect concept for your patio. Size, on the other hand, will greatly depend on the existing conditions of your backyard and other factors. The amount of space you need for your gravel patio will greatly depend on the purpose you intend to use it for. 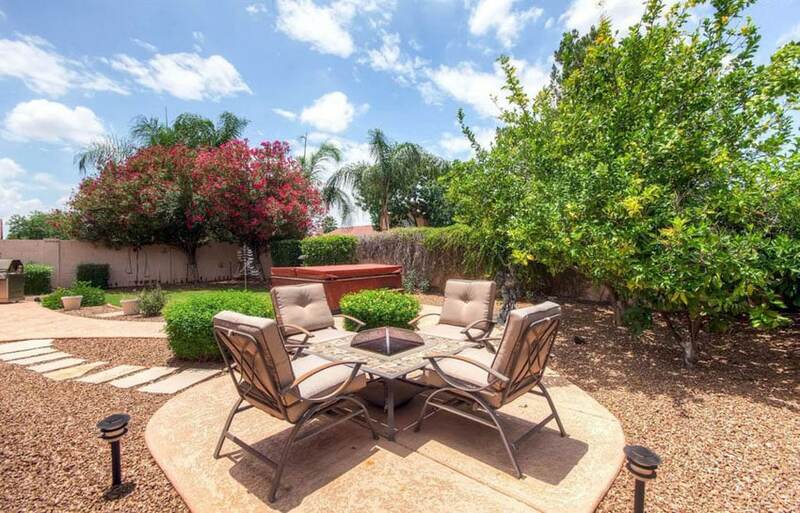 Determine the activities you will be doing here, the number of users in the area and how you want to furnish it.Small spaces are appropriate for bistro style patio set up which contains at least 2 chairs and a table. Large spaces, on the other hand, can accommodate more furniture and design elements. 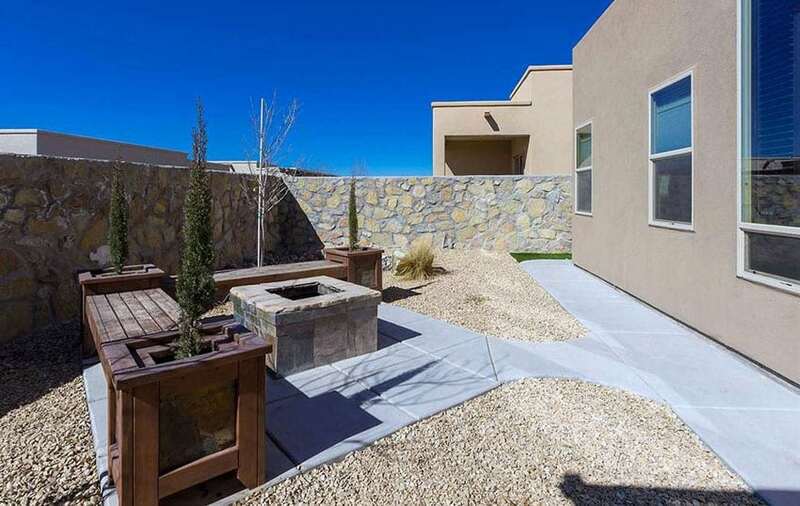 In some cases,it may be designed as an outdoor living area complete with a fire pit. Just remember that if you plan on putting an informal backyard dining area or an outdoor living room space, consider the sizes of furniture you will be using. For example, a patio which is 12 to 14 feet in size can accommodate a 48 inch table which can seat around 6 to 8 persons depending on the chair size. Also keep in mind that the size must also balance out with the surrounding environment. Consider proportion and make sure that shape blends well with the landscape. 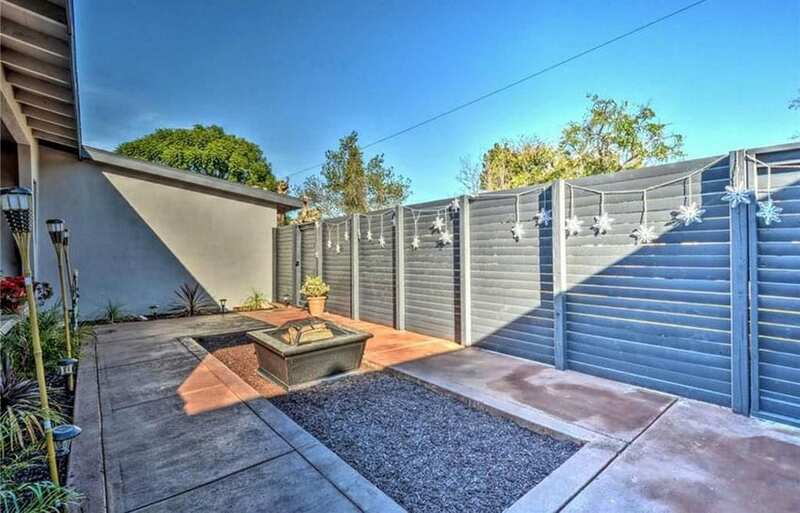 Plot the shape of your patio in the yard. Measure the existing space with a measuring tape and plot your desired shape and size onto the grass with the use of spray paint. You may use other materials to mark the space. Determine the depth of gravel. Once the purpose for the patio is decided, you can know also determine the depth of your gravel patio. The depth for the amount of gravel for a patio usually ranges from 1 inch to 4 inches. Typically a standard depth of 2 inches is sufficient, but this changes depending on the existing conditions of the ground soil. If the soil is not firm, there is a need to dig deeper. The type of base or foundation to be used will also determine the depth of the hole you need for your gravel patio. If using soil for the base, dig 2 inches deep but if adding stone for the base, dig a 4 to 4 ½ inches deep hole. Compute for the amount of gravel needed to cover the patio.To know the amount of gravel needed to cover a patio, the cubic yard needs to be determined. First, get the total area of your patio in square feet by multiplying the length and width of the space (in inches). Divide the total area by 12 to get the cubic inch in volume. Multiply the resulting number by the number of inches you want for the gravel’s thickness. Since the amount of coverage of gravel needs to be in the unit of measurement of cubic yards, convert the resulting total by simply dividing it by 27. Round this off to the nearest whole number to get an estimate of the amount of gravel you need for coverage. There are also gravel calculators available online which can help you compute your material requirements instantly. Prepare the area. Clean the area by removing weeds and spraying with grass killer if needed. Remove obstructions or debris such as roots, sticks, rocks, etc. Excavate the area. Dig the area for the desired depth. As you excavate the ground, evaluate the condition, texture and consistency of the soil. Level the dirt and make sure that the soil is tamped down. Use a hoe or shovel to compact the soil at the bottom of your excavated area. Whether using you’re using the soil or crushed stone as your base, it is important to not skip this step. Add the edging or border along the perimeter. Choose a type of edging material for your gravel patio to contain the pebbles in one place. For example, if using wood as a gravel barrier, cut pieces of 2×2 lumber according to the shape and size of your patio. Lay out wood and connect corners or ends by screwing brackets. Adhesive may also be used to join wood pieces together easily and conveniently. Let the joined pieces of edging dry and ensure that they are tightly secured. Add the base or foundation layer. Soil which is densely packed and has clay like consistency do not need an additional stone base layer. But for loose or sandy soil, add crushed stones to keep the gravel in place. Rough textured rocks work best as stabilizers for a gravel patio. Before laying the gravel, put landscape fabric on top of the foundation base. The landscaping fabric acts as a landscape barrier which separates the dirt and the gravel. It also aids in preventing weed growth and keeps rodents from digging through the ground. Add pea gravel to your patio. Pour 2 inches of pea gravel and spread evenly. Leave ½ inch space between the gravel and the edging to prevent the small stones from spilling. Level out with a rake. Take time to smooth and even out the surface of the pea gravel patio by raking. This also compacts it so that the loose pebble stay in place. 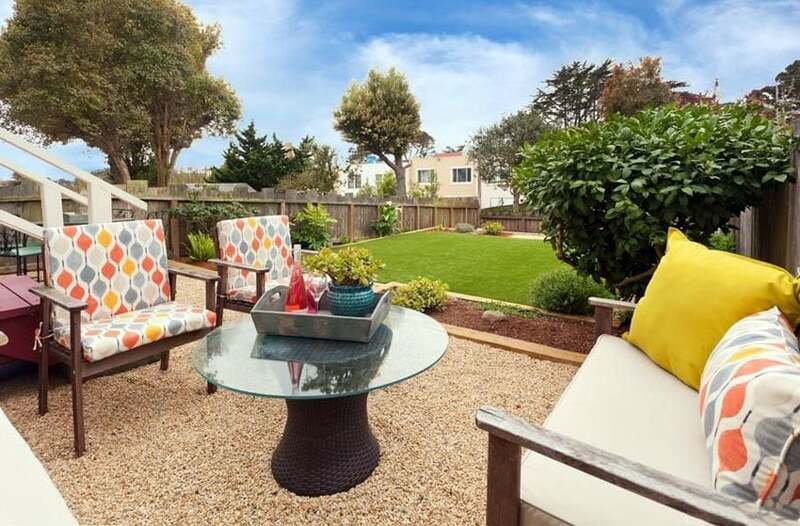 If using outdoor furniture for your patio, provide a firm foundation. Add at least 6” inches of thick rock base layer to support your furniture. This additional elements in your patio design will naturally cause appropriate changes in the depth of soil you need to dig and the amount of gravel you need to purchase. Maintenance. Maintaining a pea gravel patio would require occasional raking to even our the surface. Replenish your pea gravel patio every 3 to 4 years. Stone pavers may be set in unique patterns such as the one shown above. 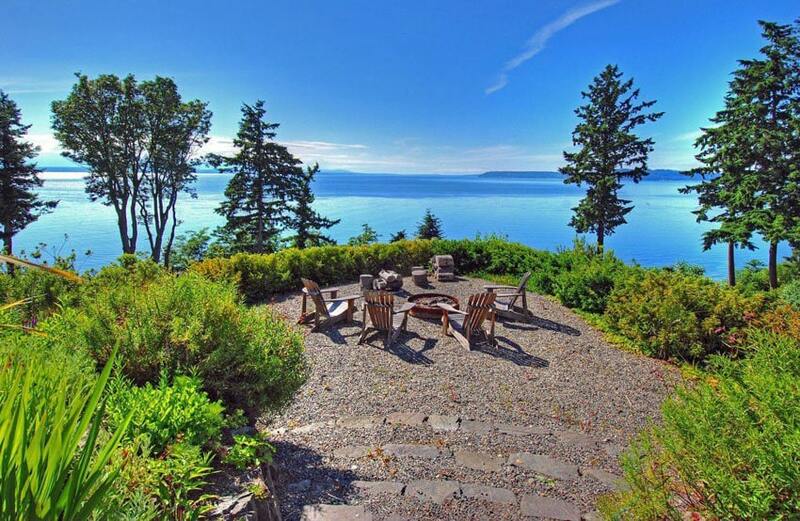 There is really no limit when it comes to designing your pea gravel patio. Use it as an interesting focal point for your landscape. Embrace outdoor living and get inspired from our gallery of different gravel patio design ideas. Paver and gravel patios work well in defining space. 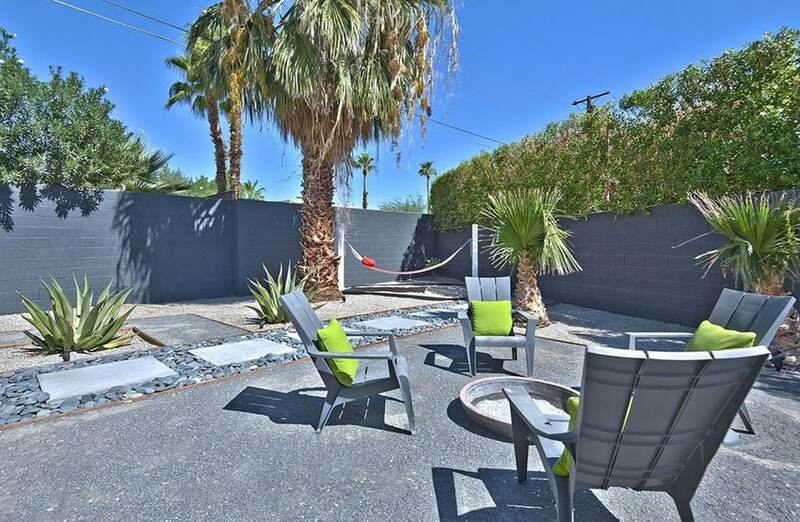 The seating area is separated by using cement pavers as flooring material. The use of simple wrought iron furniture and minimal vegetation does not make this traditional rustic themed patio overwhelming. 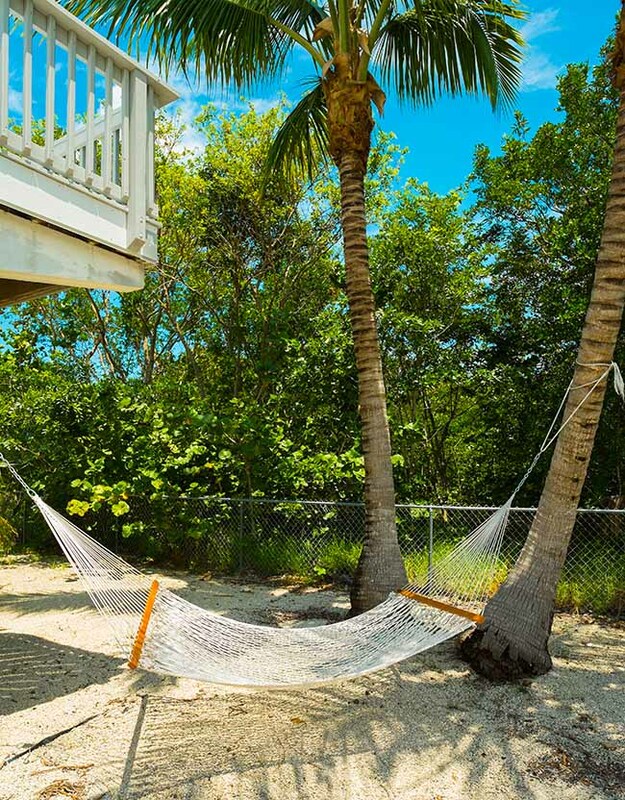 This low maintenance backyard features pea gravel spread out around several palm trees with a stretched hammock to create a relaxing escape. Interlocking pavers are available in different shapes and sizes which can be used to achieve different concepts for your backyard. Large coarse gravel mixed in shades of gray, light brown and white add character to this Mediterranean inspired paver and gravel patio design. 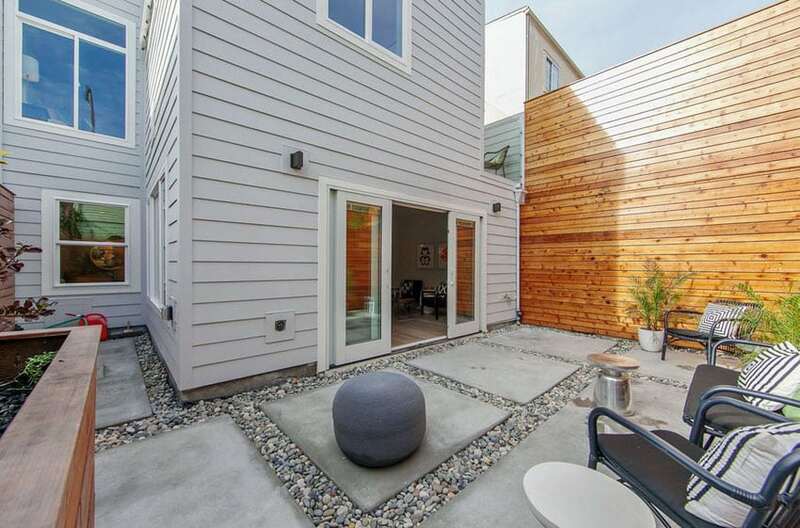 Basking in cool green tones, this contemporary brick and gravel patio evokes a calm feeling. The organic theme for this outdoor living room area is achieved by combining plants with crushed rocks fillers and a flowing design for the wall feature. Deeply textured , this design is an example of a Mediterranean inspired concrete and pea gravel patio. 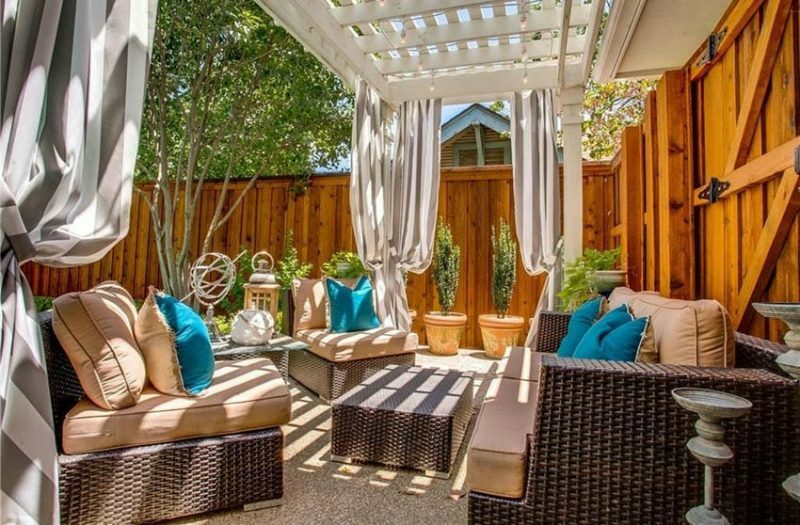 Complete with rustic wooden trellis and wrought iron outdoor furniture, the outdoor space evokes an inviting feeling. To add some contrast to the warmth of the varying textures of the materials, a hint of blue is introduced to the space. Minimalist paver and gravel patio design, this made use of square concrete blocks with gray pea seized gravel fillers. A patio doesn’t always need to have furniture and even simple designs can serve as a visually pleasing addition to your home. 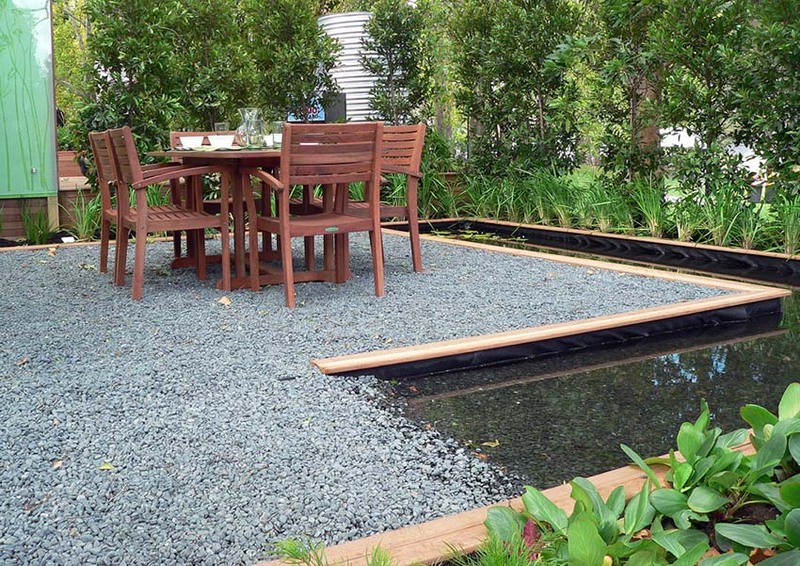 This interesting gravel patio features a pond water feature complete with lily pads and wood border. An outdoor dining table is positioned to allow friends and family to be dined and entertained. 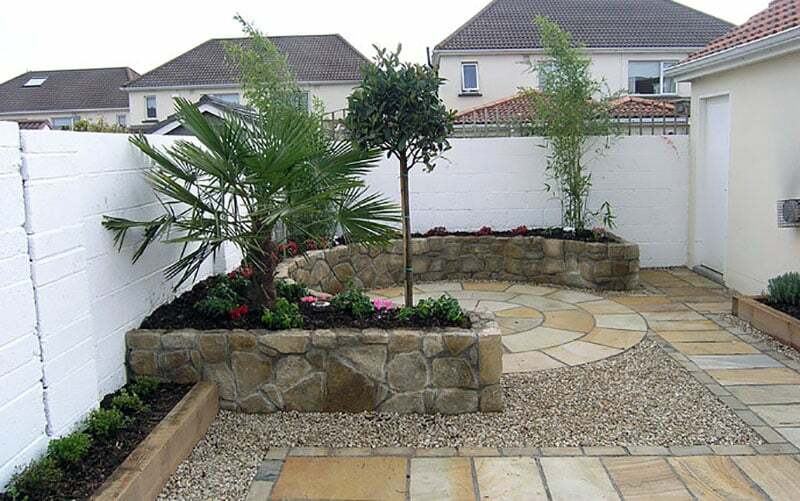 A gravel and stone landscaped backyard with rounded stone retaining wall palm trees and flowers. 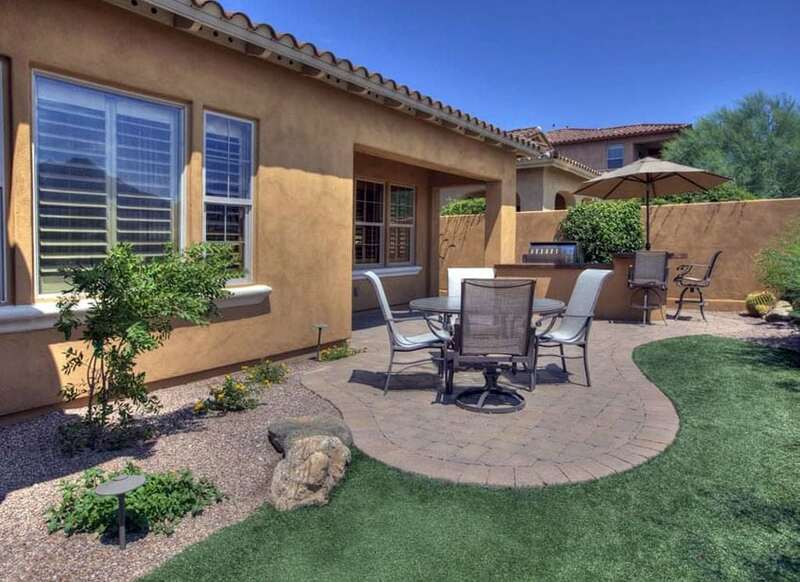 This is a modern style patio with over sized square concrete pavers and large gray stones. 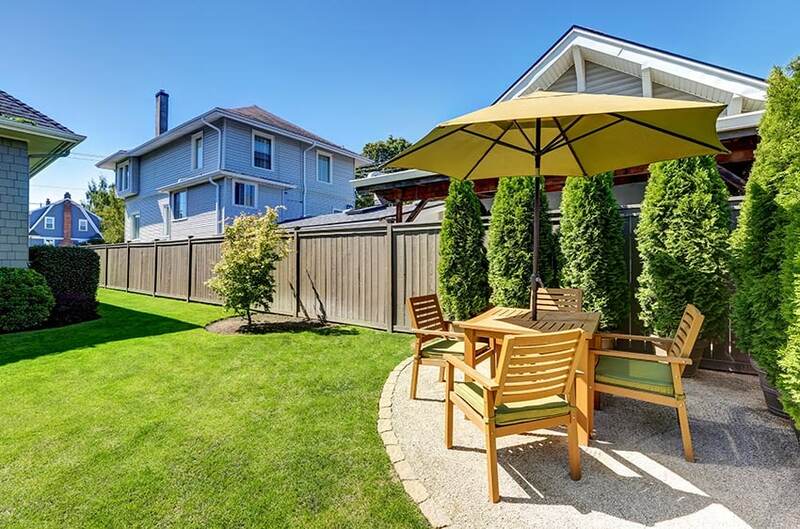 This patio design complements the minimalist look of the house and the high wooden fence surrounding it. 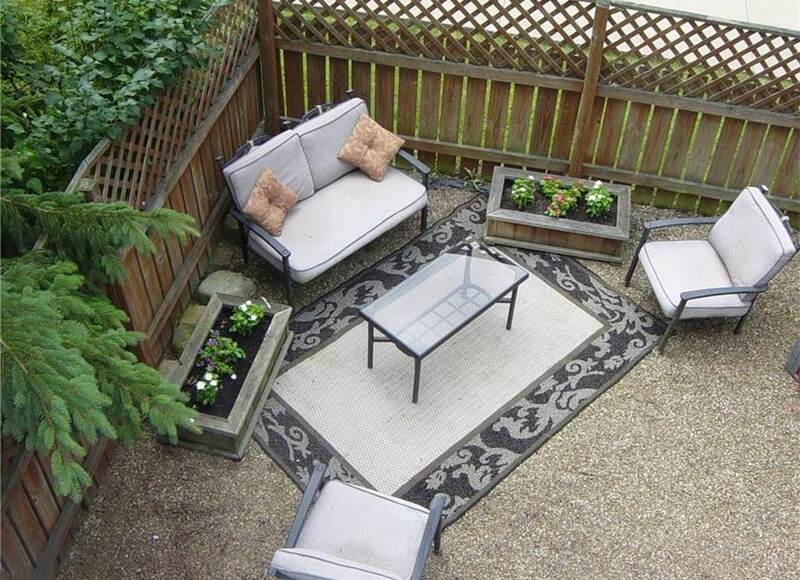 This small cozy patio features square stone slabs with a border or white gravel. 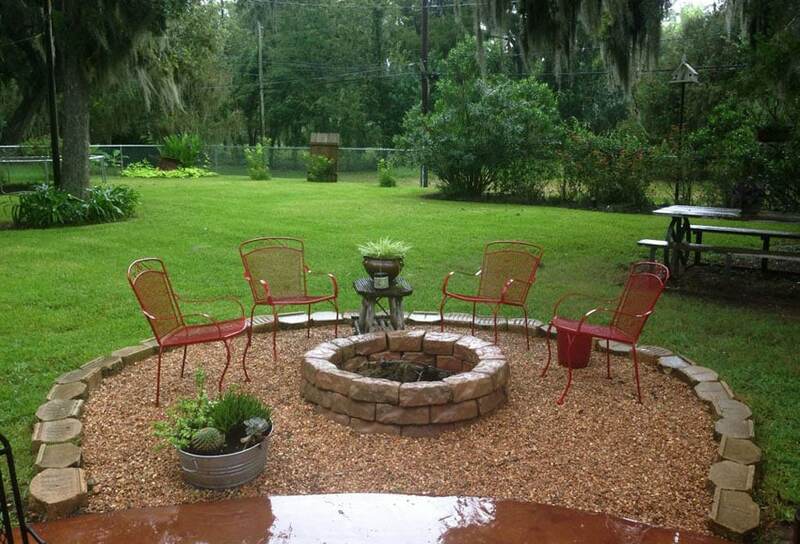 A rustic wrought iron furniture set makes this a great spot to enjoy morning coffee or to relax after a long day. Modern patio design which made use of large rectangular concrete pavers for the walkway and a combination of pea gravel and large river stones. This design illustrates the functionality of edging materials for patio as it clearly shows that it defines the different areas of the space. The minimalist look is completed with simple chairs, a streamlined fire pit and a pop of colorful pillows. Traditional style is achieved in this patio design by using combinations of white and gray pea gravel with irregularly shaped slate. 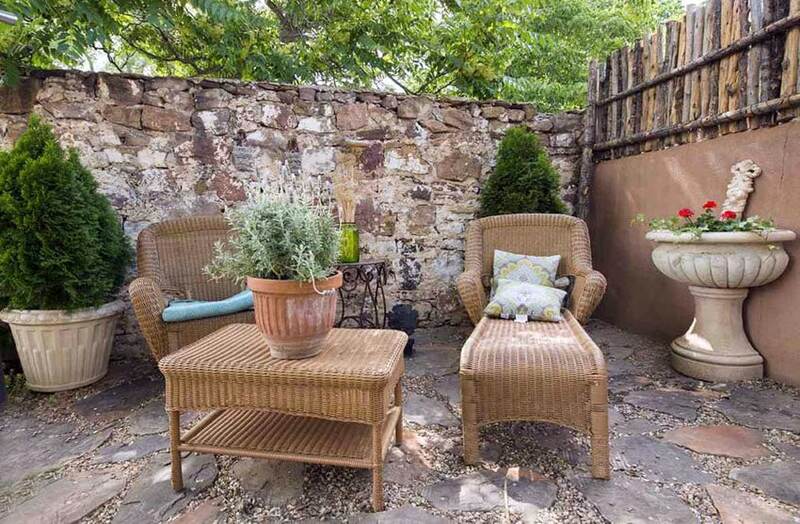 Wicker furniture and classic cast stone plant containers transformed this patio into a serene place for relaxation. A cozy rustic place for gathering with friends or family, this gravel patio design made use of large irregular rocks for the fire pit and small gray pea gravel for the flooring. The seating area is blended well with the surrounding landscape by using a stone ledge and some accent pillows. An example of a slate and gravel patio, this design showcases slate set in a uniform pattern and gray pebble fillers. This design is more formal rather than irregular stones in a random pattern. 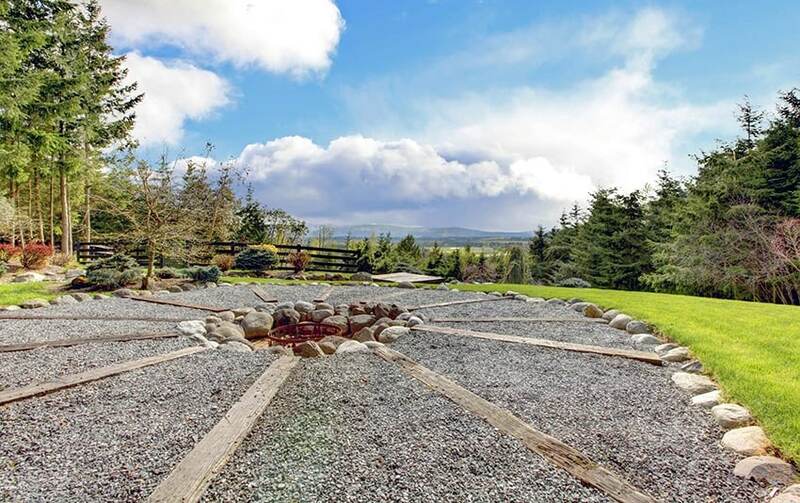 A simple take on the gravel fire pit patio, this design does not have much frills and just takes full advantage of the surrounding breathtaking view. Fill the ground with pea sized gravel and accentuate it with large pieces of slate and your patio will still be visually appealing. 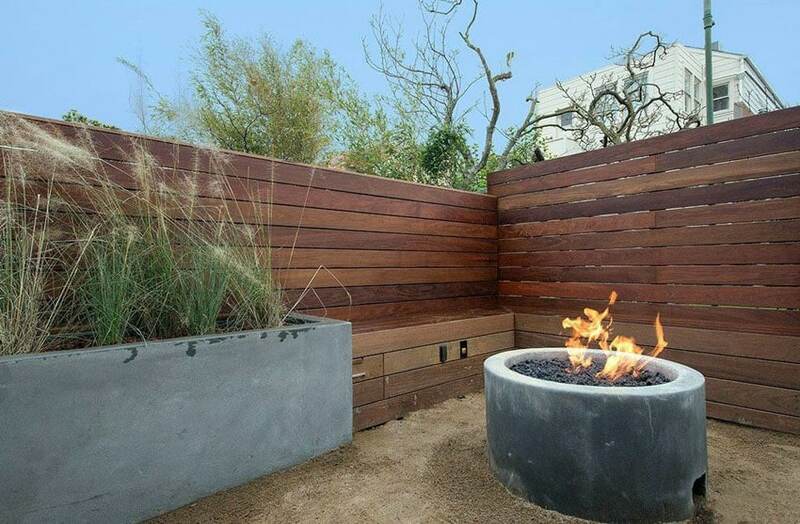 A minimalist approach to the gravel fire pit patio, this design made use of a square shaped fire pit and complementing wooden benches and simple vegetation. 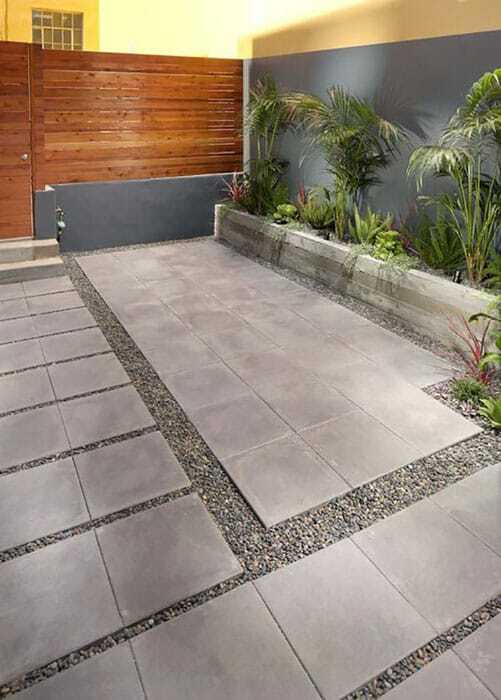 Streamlined concrete pavers and coarse pea gravel complete the contemporary look of this outdoor space. 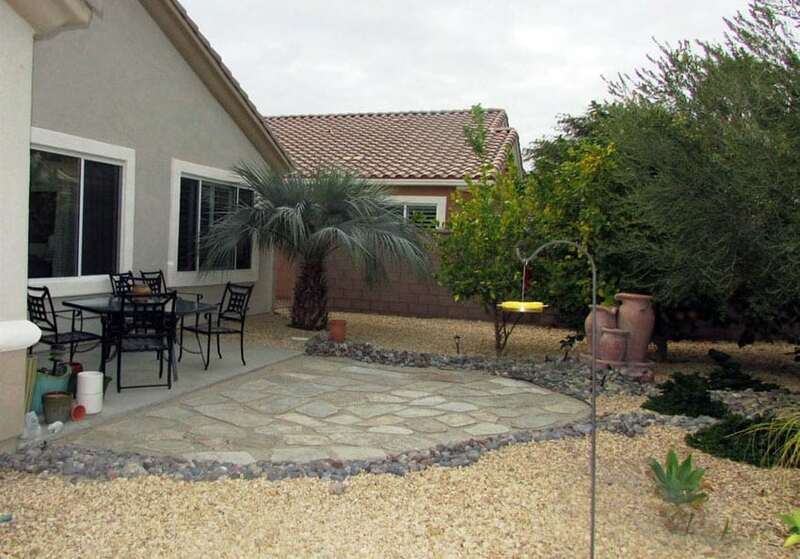 This raised patio design is made up of concrete and is set with coarse grained gray sand. The materials used in this patio create a stark contrast in terms of the design style used for the house interior. Instead of chairs, a daybed may be used to provide for a comfortable place to lounge or rest. 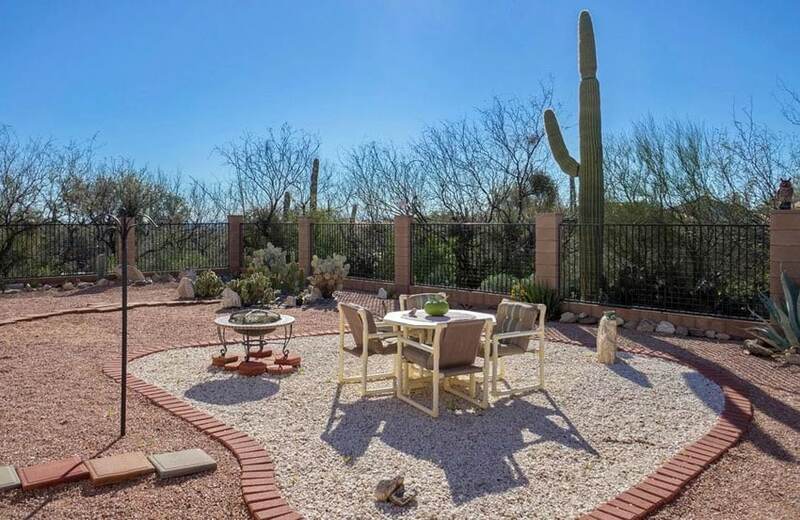 This decorative gravel and brick paver patio showcases a desert landscape with central focal point and round paver design. 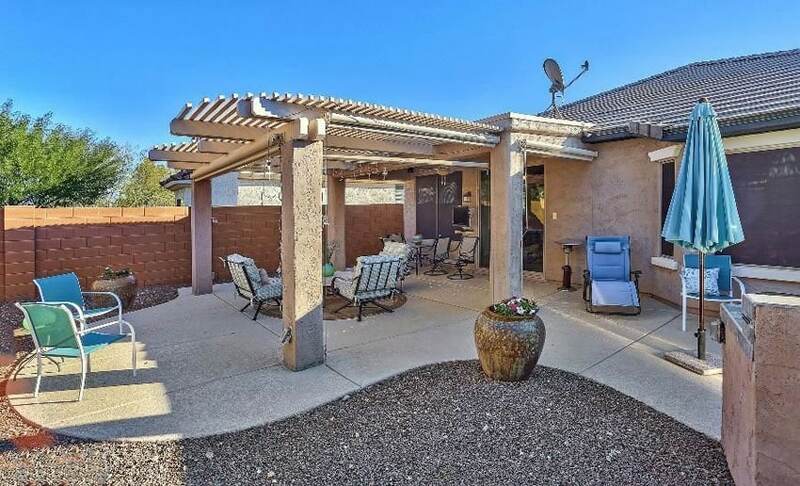 Complete with a Jacuzzi and a small grilling station, this flagstone and gravel patio is the perfect place to entertain friends and bond with family. Limestone cut in irregular shapes and sizes provide variation in texture when combined with the white and cool gray stones. 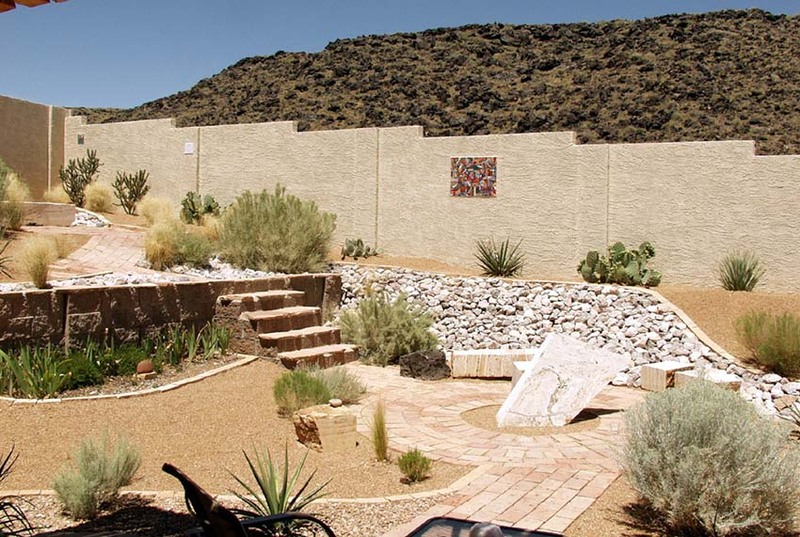 Large earth toned adobe stones are used as a fire pit wall for this patio design. 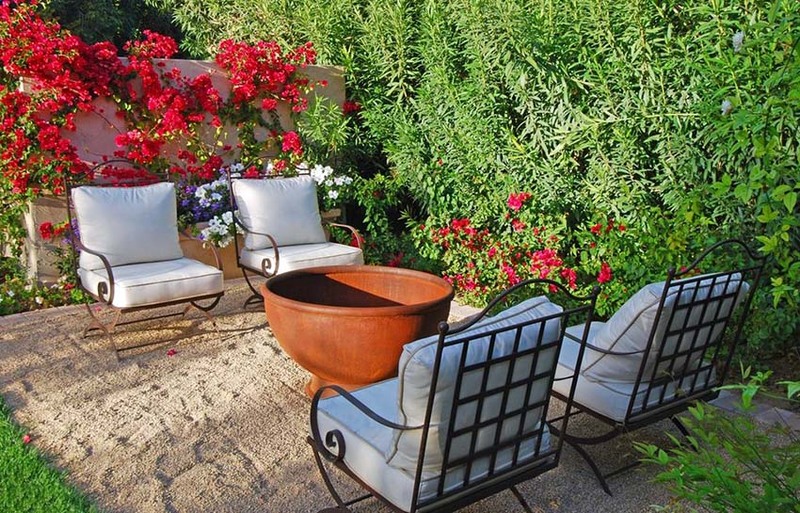 Rust colored pea size gravel adds warmth to the look and complements the color of the red metal chairs. 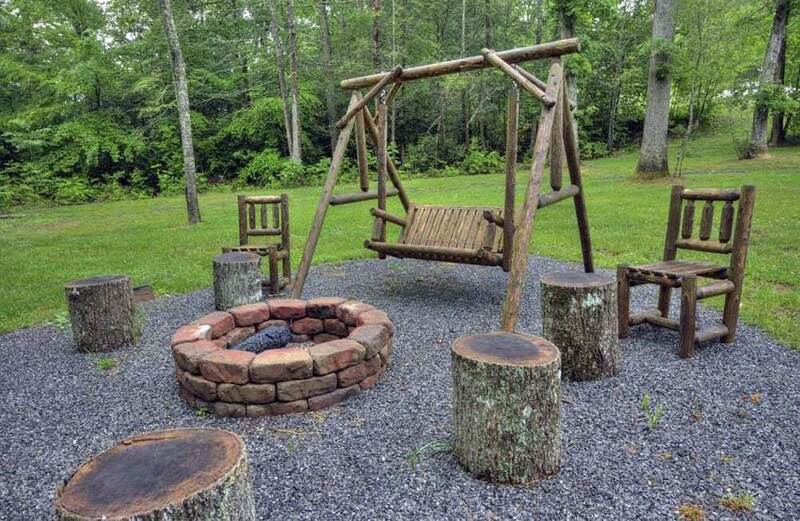 Put chopped wood blocks into good use by incorporating them into your gravel fire pit patio design. They can serve as informal seating for a rustic inspired setting. 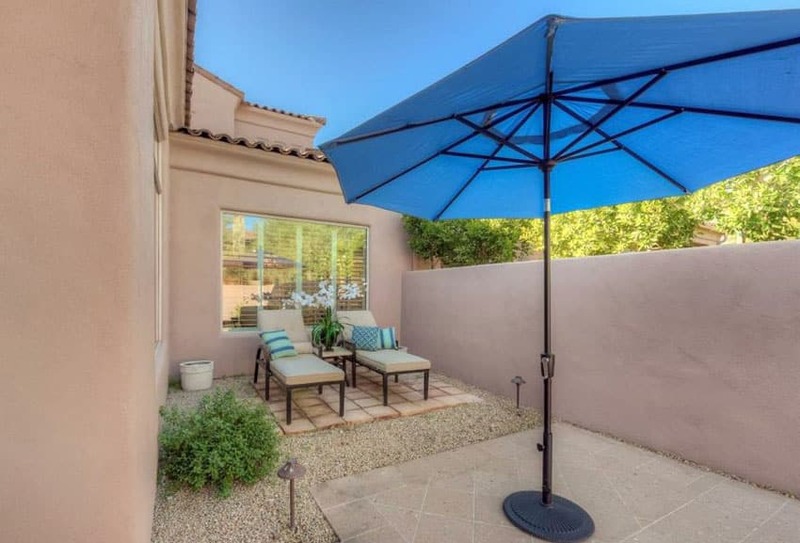 Convert a secluded spot in your backyard to a beautiful patio wherein you can lounge and enjoy a book. 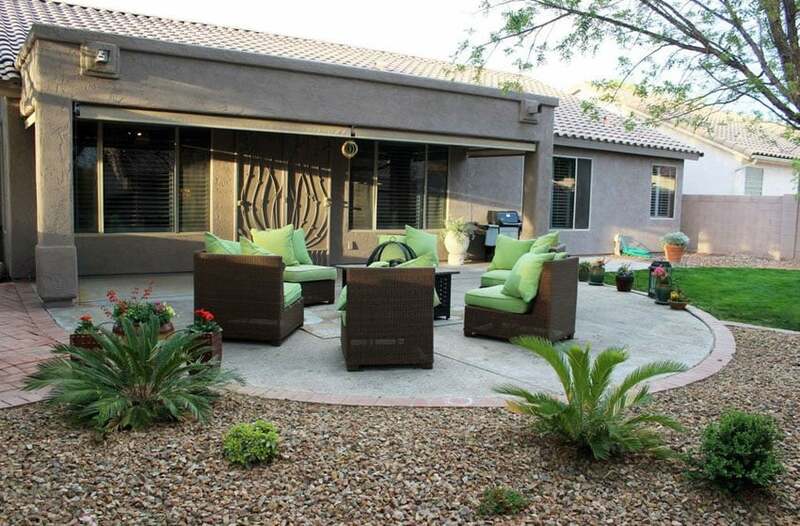 The picture above shows a paver and gravel patio which is furnished with simple lounge chairs for a perfect relaxing feel.